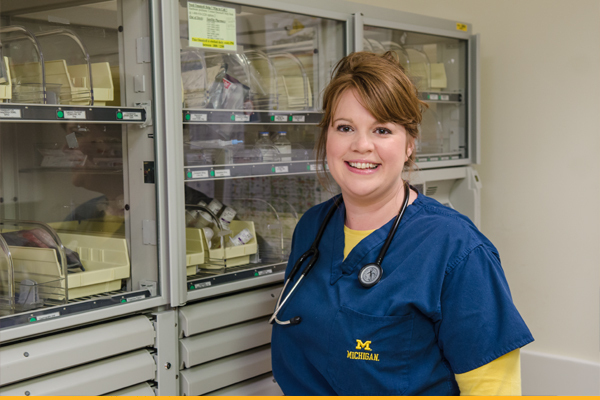 To help give you all the information you need about Michigan Medicine, and career opportunities with us, we have provided a list of Frequently Asked Questions. Choose a primary category to view related questions and their answers. How can I find out if a career in health care is right for me? If you are interested in pursuing a healthcare career, there are several ways to begin exploring your options. If you are a current student, you may want to have someone (or several people) visit your school or event, to share their Michigan Medicine experience and details about their specific career. You can also find out more about the amazing possibilities in healthcare by visiting Michigan Health Council or Health Opportunities for Today and Tomorrow. Our web site also includes a dedicated section that provides an additional FAQs for Students. Where do you currently have openings? How often should I check for newly posted positions? Our careers web site provides a comprehensive list of all jobs currently available with Michigan Medicine. New positions become available frequently, and our database is updated regularly. We recommend you bookmark our site, and check back often for newly posted positions, specifically on Tuesdays for GN, RN and LPN positions. Also, by subscribing to our RSS Feeds, you can have the latest opportunities sent directly to you via the Web. How do I apply for a job at the University or Michigan Medicine? Where do I go? The University of Michigan and Michigan Medicine both have an easy-to-use, online application process. There is a job search module on nearly every page of this site that allows you to quickly search for jobs within Michigan Medicine, by keyword, area of specialty or other criteria. For regular and temporary jobs at the University of Michigan, outside of the health system, we recommend you visit careers.umich.edu for complete details. What if I have questions about a specific job posting? Does the University recommend pre-employment testing? What is the process? HR-Recruitment@med.umich.edu with a link to take the assessment. Does Michigan Medicine offer jobs that don’t require a college degree? Are special certifications required? While most jobs at UMHS do require previous experience, the typical entry-level position may not require a degree. For a quick reference and more information about what jobs at UMHS might work for you, visit our classification website. How can I learn more about a particular field, or about which colleges/universities offer the kind of education required for a particular job? If you already know which field of healthcare you’re interested in, it’s time to start looking for the college or university that has the courses and/or curriculum needed to reach your goals. A helpful resource while you research is the Michigan Health Council. Does Michigan Medicine require influenza (flu) vaccinations? Yes, under the policy, all workforce members must either receive a flu vaccine by December 1, 2015 or an approved medical or religious exemption. Those with an approved exemption are required to wear a mask for the entire flu season in any clinical area where we provide patient care or where patients may be present. When the flu season begins, workforce members who received an exemption are required to wear a mask before entering any clinical care area. This policy applies to everyone who works at the health system, including regular and temporary staff, faculty, students, trainees, vendors, contract personnel and volunteers, regardless of clinical responsibility or patient contact. This policy includes Medical School staff and those who work in non-clinical settings as well. What Tobacco/Drug Policies are in place at Michigan Medicine? The University of Michigan has been a smoke-free campus since July 1, 2011, and that policy includes all buildings, facilities and University-owned vehicles. As part of our ongoing commitment to ensure the safest workplace possible, Michigan Medicine implemented the next phase in our Drug Free Workplace efforts on September 29, 2014. Most candidates for positions at Michigan Medicine will be required to submit and successfully pass the pre-employment drug screening as part of our overall background screening process in order to be employed. This screening will be facilitated by the Department of Human Resources and an outside vendor. I’m interested in volunteering. What is the time commitment, and how old do you have to be to volunteer? We have a variety of volunteer opportunities at UMHS, and even a place where you can find complete Information for Volunteers , including details and requirements. In general, volunteers are required to be at least 16 years of age, and commit a minimum of 4 hours per week for a calendar (or school) year. For more details, contact Volunteer Services directly at (734) 936-4327. What are the benefits like at Michigan Medicine? At Michigan Medicine, we take care of our employees. In fact, our benefits are among the most competitive and comprehensive in the region. For detailed information, visit the Benefits section of our web site. What holidays are observed by the University and Michigan Medicine?